Frostys Tree Trimmers [H1844] - $8.00 : Yarn Tree, Your wholesale source for cross stitch supplies. Cross stitch pattern from By The Bay Needleart. 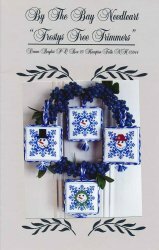 Four designs, each featuring a different snowman accented by a snowflake. Can be stitched as ornaments. Stitch count for one is 53 x 53.